Credit: Roger Hanlon, from Where’s The Octopus? Cephalopods like the octopus depicted above are considered to be masters of camouflage. In other words, they are really great at blending in with their environment. How do they do it? 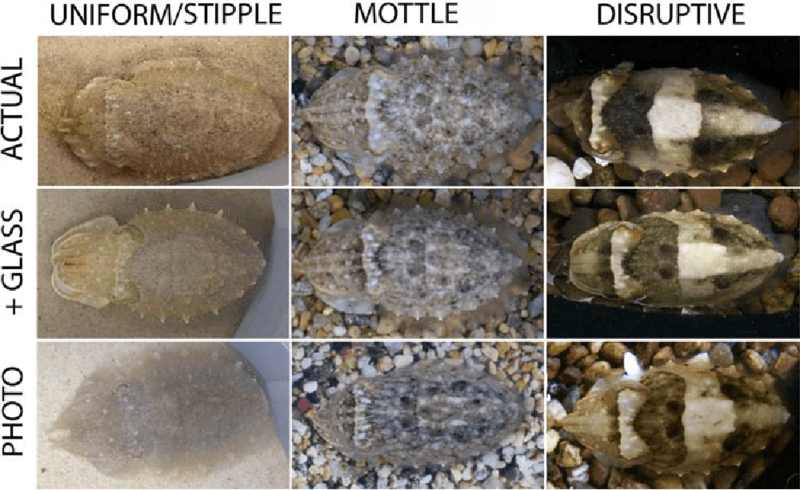 Let’s take a close look at cephalopod skin to understand the mechanisms of camouflage. Severus Snape once told Harry Potter, in Harry Potter and the Order of the Phoenix: “The mind is a complex and many-layered thing.” The same might be said of cephalopod skin. Well, it may not have as many layers as your mind, but it does have at least three distinct layers. Going from the outside in, we find a chromatophore layer, an iridophore layer, and a leucophore layer. The chromatophore layer uses spots of pigment to paint patterns; the iridophore layer bends and bounces light to display shimmering colors; the leucophore layer serves as a reflective background for everything above it. Each layer of cephalopod skin contributes its own little bit of artistry to the overall painting. 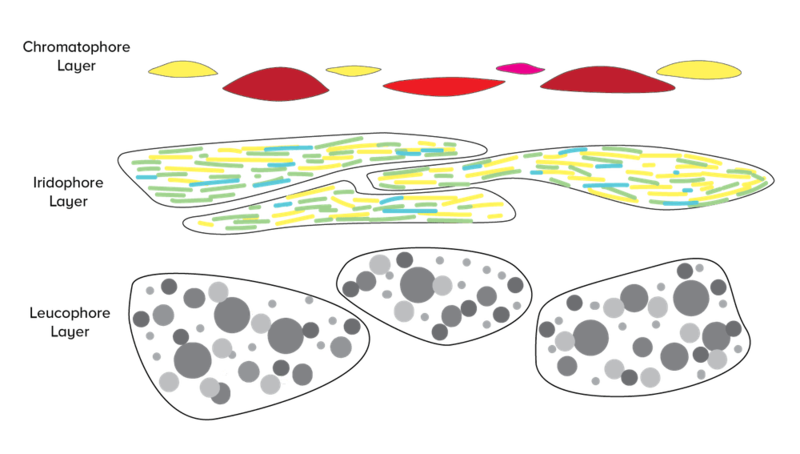 In this lesson, we will look at the first layer, the chromatophore layer, in detail. What colors and shapes do you see in these close-up views of cephalopod skin? What details can you make out? How do you think these tiny changes affect the larger view of the cephalopod? 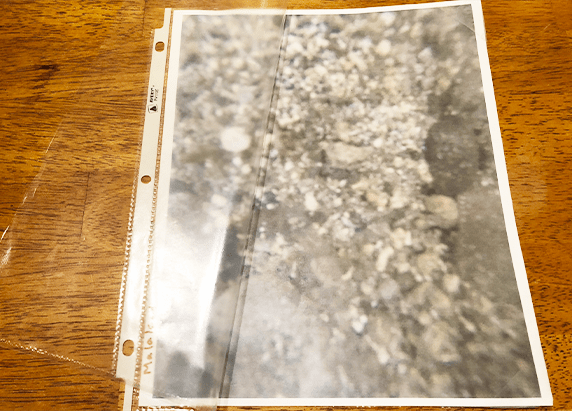 The first layer is called the chromatophore layer. (The word chromatophore means “bearer of color”). A chromatophore is an organ that contains pigments. In cephalopods, those pigments are limited to the colors yellow, red, and brown. We humans have pigment in our skin too, primarily in the form of melanin. Unlike cephalopods, however, we can’t really change the color of our skin (except maybe by blushing, bruising, getting a tan or a sunburn). So how do cephalopods do it? To understand this, we need to take a close look at the structure of a chromatophore. Each chromatophore is like a microscopic balloon filled with pigment. 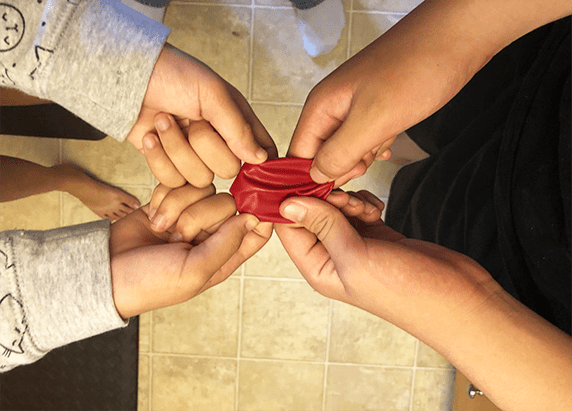 There are tiny muscles (called radial muscles) attached to all sides of this balloon. When the radial muscles are relaxed, then the chromatophore is like a shriveled, deflated balloon. Although it has some color in it, it is so small that it’s difficult to see. 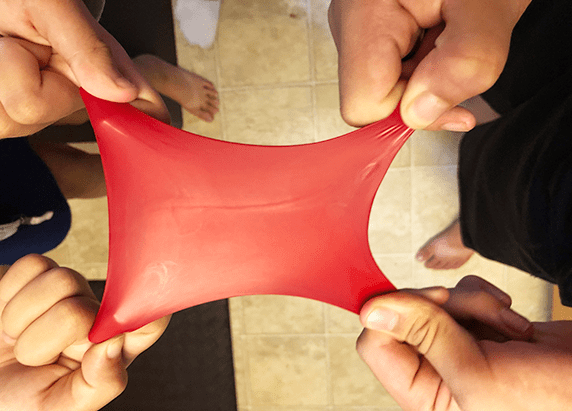 When nerve signals stimulate the chromatophore, the radial muscles pull this balloon from all sides, stretching it out, and covering more area of the skin with the pigment. Suddenly, the chromatophore is a visible spot on the skin! And since that single chromatophore is joined by an army of other chromatophores, you get all kinds of color changes—from a solid patch of red, to a mottling of brown and white, to a strange yellow shape on a dark background. 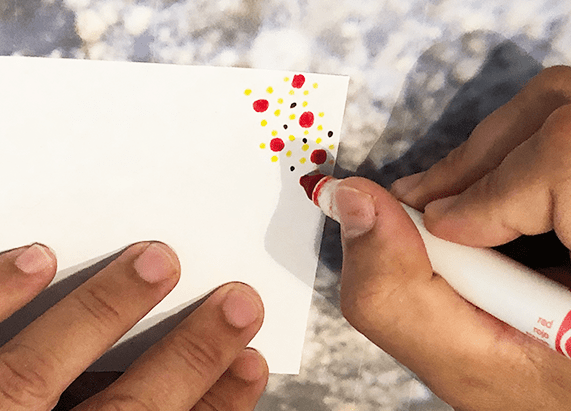 Open up the tri-fold board, and make red, brown, and yellow dots on the center section. Make as many dots of each color as the number of umbrellas you have of the matching color. For example, five red umbrellas mean five red dots. Try to space the dots out equally. Prepare one color of umbrellas at a time. Gently open each umbrella. Then, cut a section of straw about 1 inch long, and pass the toothpick end of the umbrella through it. 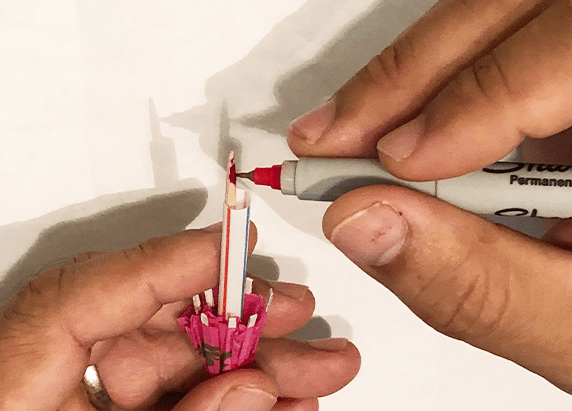 Color the end of the toothpick with the same colored Sharpie (use the brown sharpie for orange umbrellas). Place a tiny drop of glue on the runner of the umbrella (the little cuff part that moves up and down). Slide the straw over the glue, and turn it so that the glue evenly coats all sides of the runner. 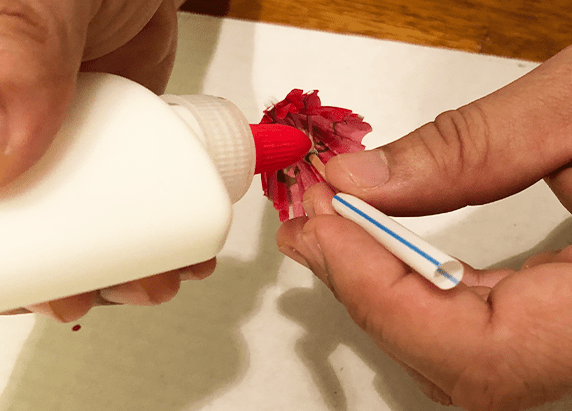 Let the umbrella sit so that the glue can dry. Prop the tri-fold upright. 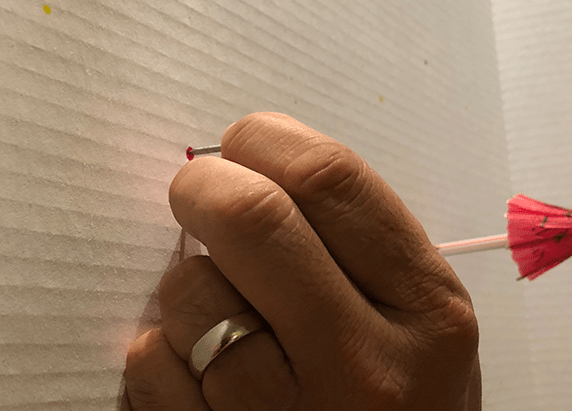 Use the nail to prepare holes on each of the colored dots. Then, pass the toothpick end of each umbrella through the holes. 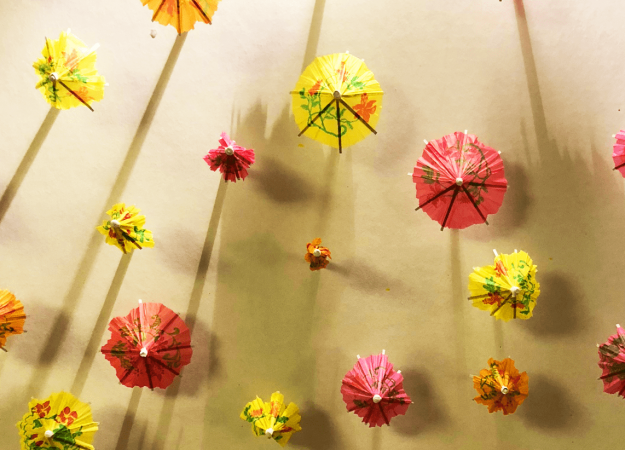 After you have inserted all the umbrellas, then you should have something that looks like this. Have a student or two stand behind the trifold. 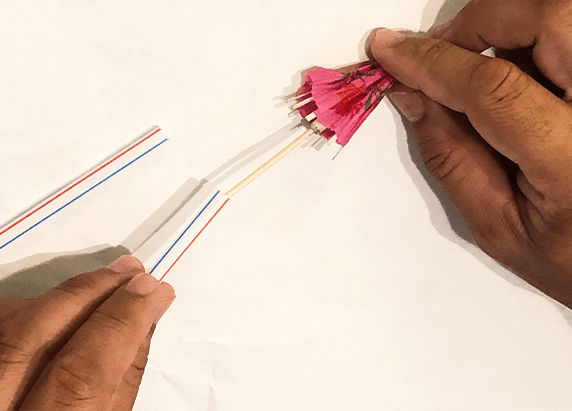 Call out a color (“Red”), and have the students (gently) pull the ends of the same-colored toothpicks to open up the “chromatophores.” The umbrellas do not close as easily. You can try to gently push the toothpicks, but if that doesn’t work, you can close them directly by hand. Can you think of any modifications that you can make to speed things up when you change colors on this chromatophore layer model? Cephalopods can open and close millions of chromatophores instantly. How do you think cephalopods manage to do this? Cephalopods are like the genie from the story of Aladdin. They have this incredible power built right into their skins. However, in the same way that the genie is limited to fulfilling only three wishes, cephalopods effectively limit their use of their “phenomenal cosmic power” to three basic options. 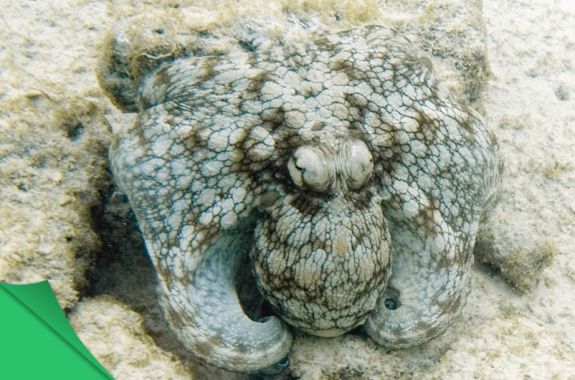 Cephalopod camouflage can be classified into only three basic patterns: uniform, mottled, and disruptive. Uniform camouflage appears as though it were one color. For example, the left column of pictures depicts a cuttlefish that is generally a single color, beige. There may be visible spots of a different color, but they are very tiny. Mottled camouflage involves the use of visible splotches of multiple colors. In the middle column of pictures, the cuttlefish uses splotches of black, white, gray, and beige in order to blend into a background of small pebbles. Disruptive camouflage involves the use of high contrast colors to form distracting shapes and patterns. When you first think about it, this type of camouflage doesn’t seem to make sense. After all, isn’t camouflage all about blending in? Wouldn’t the use of high contrast colors and weird shapes make a cephalopod stand out? Well, first of all, some backgrounds do have high contrasts and weird shapes, so the best way to blend in would be to use similar high contrasts and weird shapes. For example, in the right column of pictures, the cuttlefish is over a background of large, multi-colored pebbles. Both uniform and mottled camouflage wouldn’t serve the cuttlefish well, because the relative evenness of its coloring would make it stand out. However, by using disruptive camouflage, the high contrasts and weird shapes would make it look just like the pebbles around it. Another reason disruptive camouflage might be effective is that it might serve to confuse predators just long enough to allow a cephalopod to escape. Look at the pictures in the Disruptive column. Can you tell which part of the cuttlefish is the head, and which part is the arms? It’s difficult, right? Even if a predator was to “see” a cuttlefish using disruptive camouflage, it might not recognize what it was looking at, or it might not recognize what part was the head, or the arms. The inability to identify the part of the cuttlefish it is looking at could create a moment of hesitation and confusion on the part of the predator. That moment might just be long enough for the cuttlefish to escape successfully. Let’s Make Some Chromatophore Layer Patterns! 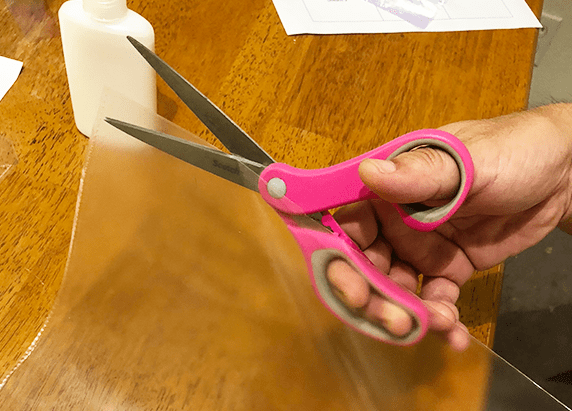 Place the template sheet into the sheet protector. Use the Sharpie pens to draw chromatophore patterns. Draw three Uniform patterns, three Mottled patterns, and three Disruptive patterns. You can look at pictures of the camouflaged cuttlefish above for ideas. One student’s examples are pictured above. 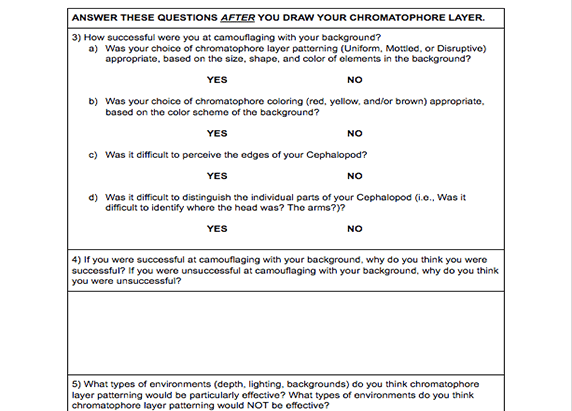 After you complete your chromatophore patterns, then please answer the questions on your Student Handout for Activity 2. Look at the undersea background you have selected. Answer Questions 1 and 2 on Student Handout 2. Optional: Using a white post-it or a square piece of white paper, experiment with where you will place your cephalopod outline on the undersea background. Then, using the watercolor pens, experiment with the patterns and colors that you will use. Note: Watercolor pens are used to prevent accidentally marking the background; however, they still may bleed through if you are not careful! Cut the sheet protector at the right and bottom edges, so that it can open and close like a folder. Place the background you are working on into the sheet protector folder, and tape it in place. Select a cephalopod outline. 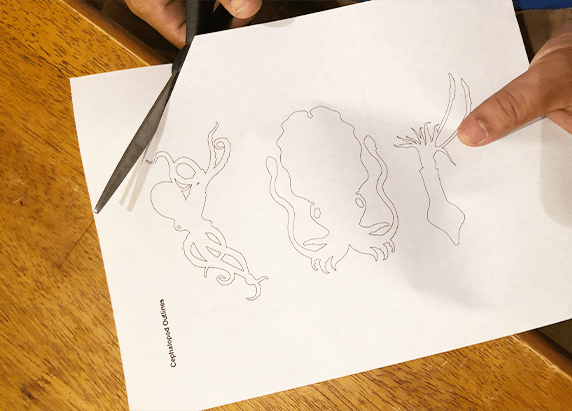 Carefully cut out your chosen cephalopod outline. 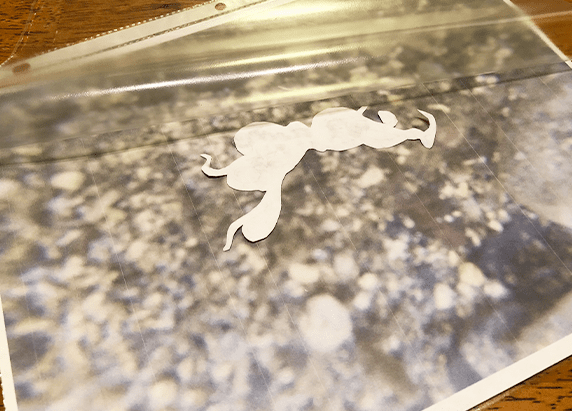 Using the glue stick, paste your cut-out onto a selected region of your undersea background. Close the sheet protector folder over the background. Consider your background, and where you placed your cephalopod. 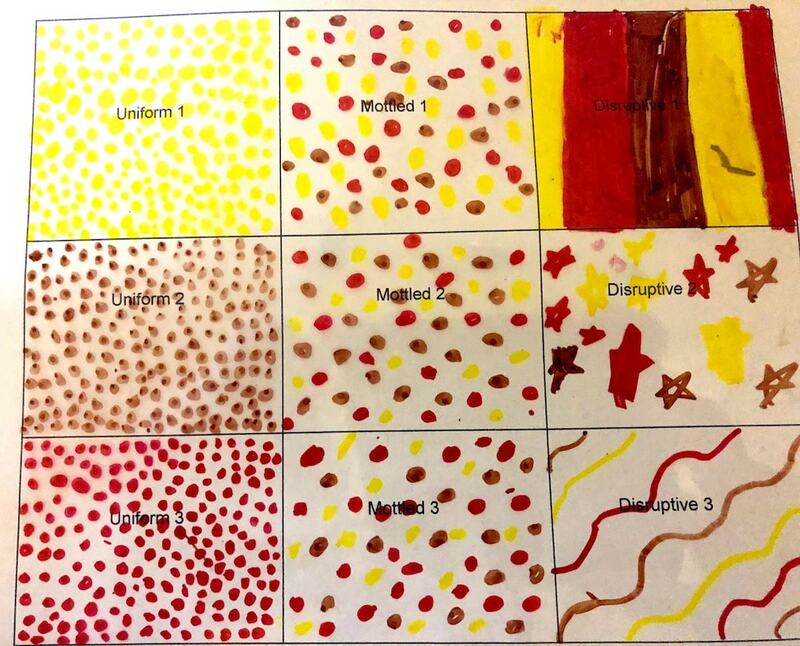 Look at the chromatophore patterns that you created in the previous activity, and decide on the type of patterning (uniform, mottled, disruptive) and coloring (red, yellow, brown) that you will use. 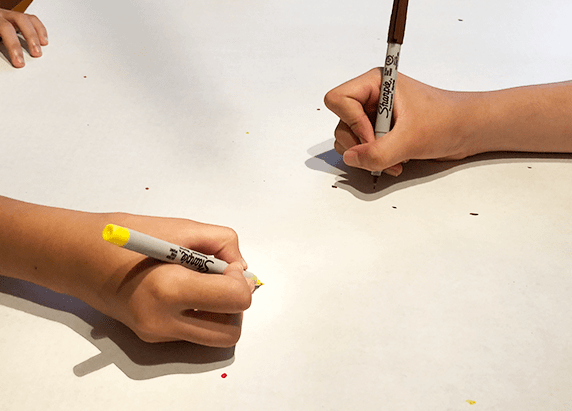 Draw your chromatophore pattern onto the sheet protector overlying your cephalopod cut-out with the Sharpie pens. If you are doing this activity as a class, then have each student display their work. 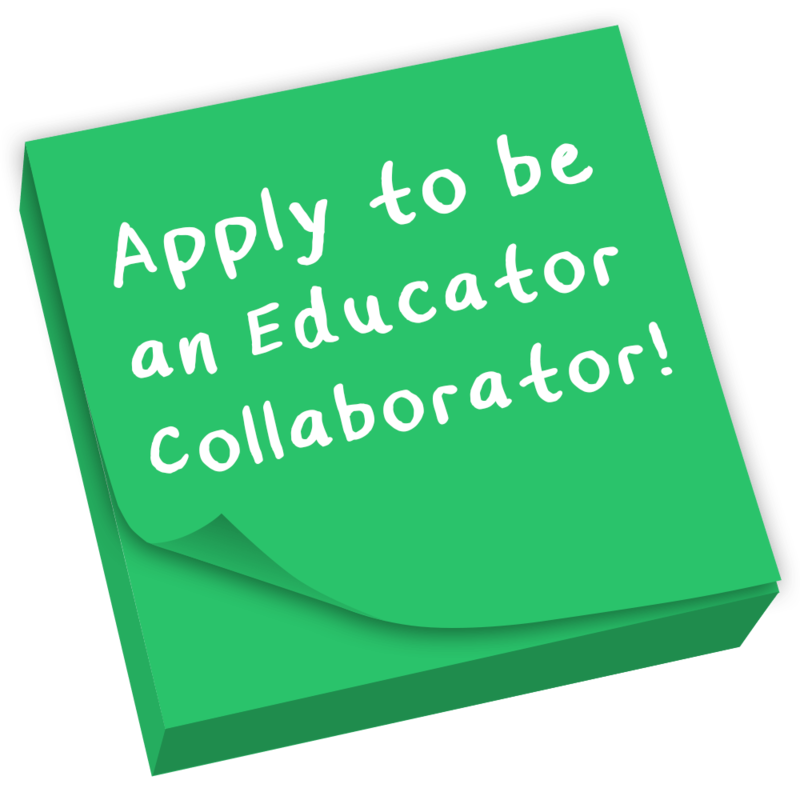 Hold a gallery walk so that students can see each others’ work. Answer Questions 3, 4, and 5 of Student Handout 2. You may have come to the conclusion that chromatophores are not as effective when camouflaging over blue or green backgrounds. Yet many cephalopods (particularly squids) are pelagic (which means that they live in the open ocean), and are surrounded by blue or green backgrounds all of the time. How do these cephalopods camouflage? 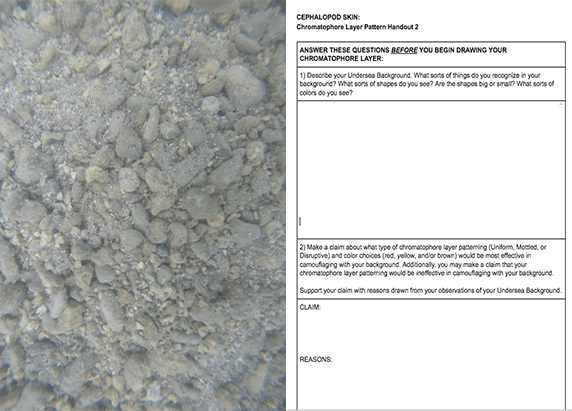 Use this Student Reflection page to help you summarize how this layer is so important to cephalopods. In this lesson, we have discussed the capability of cephalopod skin to change color. But cephalopod skin also has the capability of changing texture. Click here to learn more about this amazing ability. 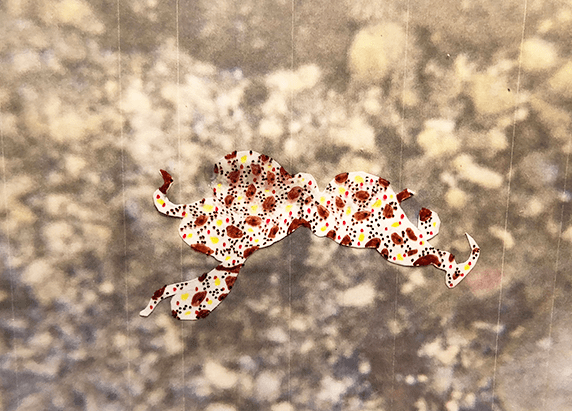 You can also click here to do an activity in which you can make a model of the shape-changing structures of cuttlefish skin! Some cephalopods also use bioluminescence to help them camouflage. 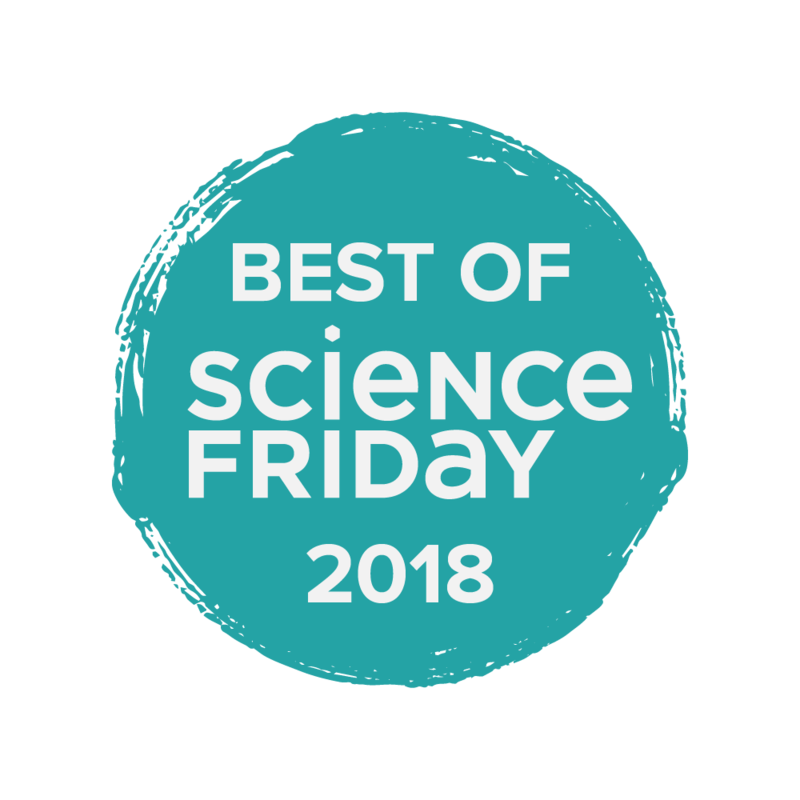 Click here to learn about the incredible Hawaiian Bobtail Squid, and the symbiotic relationship it has with a bioluminescent microbe. Did you know that cephalopods are color-blind? If so, how can they process visual information so quickly and accurately when camouflaging? One theory is that their skin can actually “see!” Learn about this theory here. 4-LS1-1: Construct an argument that plants and animals have internal and external structures that function to support survival, growth, behavior, and reproduction. Special thanks to Tom Iwanicki of UH Manoa for his ideas and support during the development of this resource. Randy Otaka is an elementary school special education teacher and robotics coach for Wahiawa Elementary School in Wahiawa, Hawaii. He has a passion for STEM education and implements interactive and engaging lessons, such as using Minecraft to model the cardiovascular system to creating scale model solar system orbital paths. How Do ‘Killer Snails’ Kill Their Victims? Model the hunting adaptations and a rich peptide venom cocktail of predatory cone snails in this exploration of the organism's structure and function.